This safari starts from the Gambia to Senegal, you will need your passports for some border formalities. In Gambia, Bako Tours will take you to up river to Baboon Island to see some chimpanzees and hippopotamus. In Senegal, they will take you to Fathala Game Reserve to see the Big Five and other wildlife such as giraffe, rhinoceros, zebra, many species of antelopes, and more. The accommodations for this safari are in bungalow huts and luxury tents with electricity and fan. You will be picked up at 8 a..m and be driven up the river to Tendaba Camp, situated at the Cape of the Gambia. The accommodation is in twin or single rooms, of acceptable standard. Upon a rival at Tendaba Camp, you will take a pirouge across the River Gambia, in to the small creeks in the mangroves, to the north bank of the Gambia which is rich in bird life,monkeys and crocodiles and many to see. Lunch will be served at 2 p.m. In the evening, you will be driven to the neighboring villages to see the Gambian way of living and their family set up. At 8 p.m., dinner will be served and some optional entertainment will be call by the villagers before bed time. Breakfast will be served at 8 a.m. You will depart from Tendaba to George Town. On the way, you will be having some stops for comfort and drinks. Upon arrival in George Town, you will be taken in a camp called Bao Bolong Riverside Camp. The accommodations are basic double and single with electricity, fan, and toilets. Immediately after check-in, you will start cruising in the river to Baboon Island to see chimpanzees and hippopotamus. The Chimpanzee Rehabilitation Project Camp (Badi Mayo) is in the River Gambia National Park, 270 kilometers up-river and is located just below the edge of the mainland cliffs overlooking the river and Baboon Islands. Lunch will be served onboard while cruising. You will be back to Boa Bolong Camp at 7 p.m. and dinner will be served at 8 p.m.
Breakfast will be served at 7:30 a.m. then you will depart from Bao Bolong Camp for the awaited safari in Fathalal Game Park in Senegal. This time, you will drive in the north bank of Gambia. On the way, you will have a visit to Wassu Stone Circles (a historic site). From Wassu, you will be driven to a major town called Farafeni. Lunch will be served at 2 p.m. in a local restaurant. From there, you will be driven to a Gambian border village called Amdalye for some border formalities and will cross in to Senegal to a Senegalese border town called Karang for another border formality. From Karang, just about 15 minutes' drive in to Senegal, you will arrive at Fathala Game Park. The accommodations are in bungalow hut and luxury tent in single and double with electricity. Upon arrival, an optional walk with the lion will be offered. It is not included in the price, but it is better to experience it. Dinner will be served at 8 p.m.
Breakfast will be served at 7:30 a.m. After that, you will start the game drive this time, with an open Nissan Patrol. You will have the opportunity to spot some of the Big Five and other wildlife such as giraffe, zebra, rhinoceros, many species of antelopes and more. After the game drive at around 2 p.m., you will be departing for home to your respective hotels around the resort area. This marks the end of the safari. This safari will take you through Tendaba, George Town, and Bao Bolong, in Gambia and Fathala Wildlife Reserve in the country of Senegal. Fathala Wildlife Reserve in Senegal is an area that consists of approximately 6000 hectares of original and protected forest, providing guests with the opportunity to visit an original stretch of the African wilderness in it's original condition. There you can see wildlife such as Africa's Big Five and other wildlife. You will be provided with daily breakfast, lunch, and dinner during this safari. You will also be provided with complimentary two bottles of water and soft drinks per person per day and coffee and tea. Please book your flight to arrive at Banjul International Airport (BJL). Transfer from and to the airport is included. Bako Tours will pick you up from the airport. Airport: Banjul International Airport Flughafentransfer inklusive: Banjul International Airport Keine zusätzlichen Kosten. Sie können dies im nächsten Schritt anfragen. Der Restbetrag ist 5 Tage vor der Ankunft zu zahlen. Bako Tours is a Tour operator in Gambia, Africa. They offer safaris, nature tours, sight seeing tours fishing, and bird watching tours. 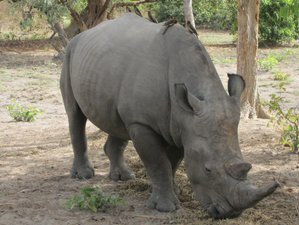 Für diesen Veranstalter können Sie Ihre Buchung durch BookAllSafaris.com garantieren. Alle gängigen Kreditkarten werden akzeptiert. Ich möchte gerne den BookAllSafaris Email Newsletter erhalten, mit speziellen Safari Urlaube Angeboten und Rabatten. Teile diesen Safari Urlaub mit deinen Freunden.